These words, uttered all season long in the calming cadence of James Earl Jones, linger now as a sardonic mockery of our program’s state of affairs. As Michigan fans, we unrealistically expect greatness in our athletic endeavors, ignoring the staunch unlikelihood of perfection. Whereas an 8-5 season and bowl appearance are honors in their own right for most in the FBS, for us such accomplishments are merely entitlements. We are fortunate to cheer on a legacy of overwhelming accomplishment, and must remind ourselves to count our blessings as a program etched in the upper echelons of College Football history. That said, it is hard to view Michigan Football’s 2017 season as anything but a disappointment. In Jim Harbaugh’s third year at the helm, the Wolverines trudged along through misstep after misstep, salvaging a winning season out of an anemic offense and inconsistent quarterback play. The renewed dynasty Harbaugh’s return to Ann Arbor promised seems more distant than ever, and fans now must wait in suspense to see what lies ahead. Above all else, Michigan struggled to secure consistent quarterback play. The Wolverines primarily placed three different quarterbacks under center: Wilton Speight, John O’Korn, and Brandon Peters; all three performed at a relatively consistent level of mediocrity, albeit for different reasons. Speight, following a promising 2016 performance, saw his season end prematurely following an injury against Purdue. From there, the baton passed between O’Korn and Peters, who displayed an equal inability to kickstart the offense. O’Korn struggled to accomplish anything on offense, recording only two touchdowns against six interceptions — three against Michigan State. Peters fared no better, improving in completion percentage and TD/INT ratio while severely lacking in accuracy and strength. Simply running the same three running plays and simple screens and slants will almost assuredly lead to failure. Despite our woes under center, I refuse to place blame only one person. Offenses function as a unit; if one component fails, it is the responsibility of the remaining members to pick up the slack. Rather, I believe our inability to produce on offense — particularly in the red zone — stems from Offensive Coordinator Tim Drevno’s ineffective play calling. Take this year’s competition against Michigan State as an example. In the pouring rain, accompanied by 100,000 strong singing Mr. Brightside, Mr. Drevno saw it fit to employ a pass heavy offense with his already struggling stable of quarterbacks. The result? Five turnovers. Who would have guessed a torrential downpour would make it difficult to throw the ball? This poor foresight prevented the Wolverines from exploiting weaknesses in opposing defenses to truly become an explosive offense. A myriad of ill-timed screen plays, overreliance on the run, and general lack of in-game awareness handcuffed our ability to score, rendering us predictable and sloppy. Going forward, Michigan must fully employ the versatility and diversity of its offensive playbook. Simply running the same three running plays and simple screens and slants will almost assuredly lead to failure. Worst of all, Michigan seemed ill-prepared to hold onto the damn football. The Wolverines finished an abysmal 90th in turnover margin, placing only slightly better than FBS powerhouse Eastern Michigan. Turnovers played a particularly destructive role in the Outback Bowl against South Carolina: a whopping five turnovers allowed the Gamecocks to surmount a sixteen point lead in the second half alone. Sloppy play cannot be tolerated any longer. Michigan must polish up its act if it wishes to rejoin the ranks of Big Ten elite, let alone the AP rankings at all. In the background of Michigan’s offensive woes, our defensive unit led by Don Brown staved off all adversity and continued to impress. Following the loss of ten starters, many expected our dominant defense to crumble; however, strong coaching, combined with ferocity on the line, kept Michigan competitive. In fact, the Wolverines finished third best in the FBS for total defense; without their stellar performance, we surely would not have accomplished a winning season. So, here we are. An 8-5 Big Ten team who stained the conference’s perfect bowl record and failed to defeat any of its major rivals, let alone any teams finishing their seasons ranked. While our recruiting class appears strong, especially with the addition of Ole Miss transfer Shea Patterson, 2017 left much uncertainty for the Wolverine faithful. In the denouement of College Football’s arduous journey, media attention often falls upon the man in charge — in our case, Mr. Jim Harbaugh. 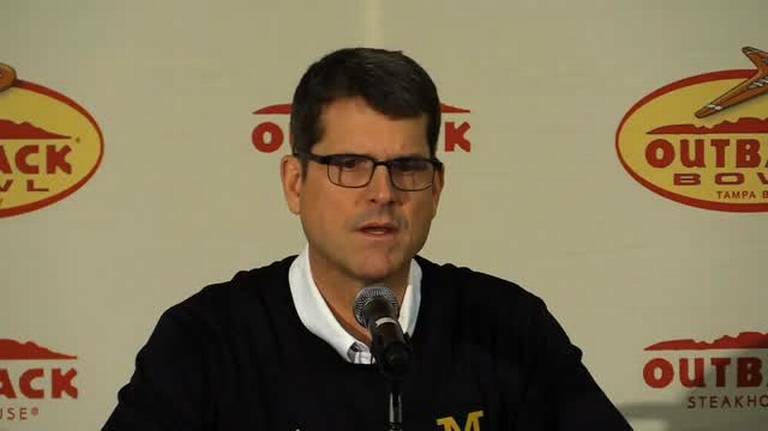 Harbaugh’s critics often assert he has far more hype than he deserves. They have a point; in his three-year tenure, Harbaugh’s program holds a losing record to rivals, with zero wins against That Team Down South. He holds a dismal 1-2 record in bowl games and zero appearances in the all-illusive College Football Playoff. It isn’t too difficult to see why many fans wish for “Harbaugh-mania” to be put out to pasture. However, take into consideration where we started. Harbaugh and his coaching staff have transformed a Rodriguez 15-22 team and a Hoke 31-20 team into a 29-10 program in just three years. This leads me back to my opening point: reaching the CFP, let alone winning the Big Ten, is hard. Very hard. To expect one man to transform nearly a decade of mediocrity into a powerhouse program in only three years is ridiculous. Dynasties take time to build, so Michigan fans should remain patient in the wake of some objectively positive, if not especially promising or pretty, seasons. Every play seemed meticulously planned and practiced, functioning like a well-oiled machine. Michigan, on the contrary, seemed to trip its way forward all season long. At the end of the day, success in the FBS ultimately boils down to discipline. With so many moving parts to control, it takes a steady hand at the lead to ensure the proper functioning of every part. As painful as it might be, we need only look at rival Ohio State to see such discipline in action. Watching them against USC, in spite of their missteps, I noticed poise and professionalism in their game against USC, despite their missteps, that Harbaugh’s program severely lacks. Every play seemed meticulously planned and practiced, functioning like a well-oiled machine. Michigan, on the contrary, seemed to trip its way forward all season long. Come 2018, Michigan Football no longer deserves its annual pass to the media hype train that inevitably precedes each disappointing season. Our efforts no longer warrant a ranked start, as we inexplicably seem to be each year. The Wolverines must earn that honor through a steadfast commitment to discipline, above all else. If we choose to forgo discipline, fans better prepare themselves for a new Michigan standard — a standard of mediocrity. Look no further than this comment to see why Michigan has had a decade of mediocre football. There is no humility in the culture of this football program, they would rather count their pre-WW2 national championship rings. It’s hard to breathe when you choke on your own arrogance.